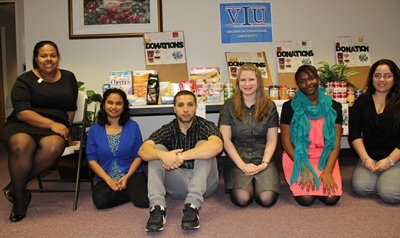 All through November, VIU collected donations of non-perishable food items for the Capital Area Food Bank, a non-profit organization that provides meals for local people in need. At the end of the month, VIU Student Affairs staff delivered the donation to the Food Bank distribution center – VIU had collected 165 pounds of food! Currently, the Capital Area Food Bank serves over 2.1 million meals each month and expects to distribute over 30 million pounds of food, including 15 million pounds of fresh produce, to families in need. Virginia International University is an active member of the local community, with both students and staff volunteering their time and donating to several area charities and organizations. During the holiday season, as we gather to celebrate with family and friends and eat lots of delicious treats, it is important to remember that there are many in the local area who cannot afford food. Despite the local area’s high median income and relatively low unemployment, the number of families suffering from hunger is increasing steadily. While earlier families depending on food donations were generally concentrated in poor inner-city neighborhoods, due to the recent recession, the need has spread to suburban lower-middle class neighborhoods, too. Many families are forced to choose between eating a meal and making a mortgage payment. Food insecurity, a person’s inability to “consistently access the adequate amount of nutritious food necessary for a healthy life,” is also on the rise. The USDA reports that in the United States, approximately one in four children lives in a food-insecure household. In donating the Capital Area Food Bank, VIU students and staff can see the immediate impact of the food donations on the local community. The food is given to people in need in several different ways – prepared fresh in soup kitchens and Kids’ Cafés around the DC metro area as well as given out to local families and individuals to cook at home.